I love baking with the kids! Cookies, breads, cakes… all of it. Baking gives them many opportunities for them to actually do the work. It is fun to let them get their hands dirty and create something delicious. 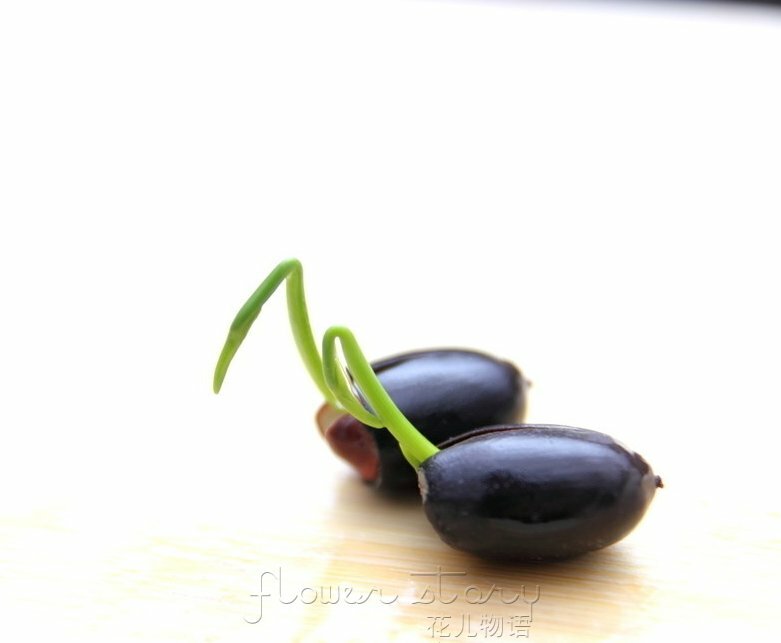 It is also a good opportunity for me to practice, letting go! One of our more recent favorites is Soft Pretzels. 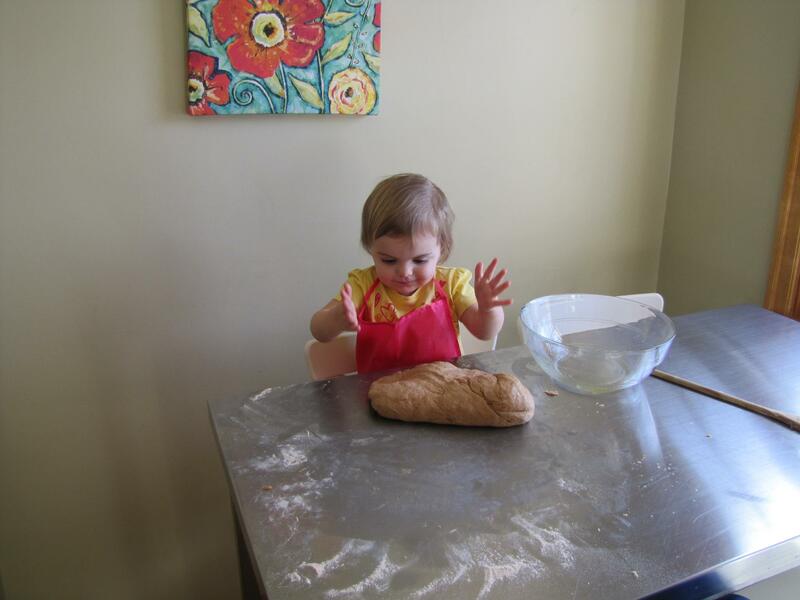 The kids help with the mixing, the kneading and have a great time making the pretzel shapes after I get them rolled out. They were delicious, but then I started reading the comments, where there are always good hints on tweaking the recipe. This is the version we have landed on and loved! 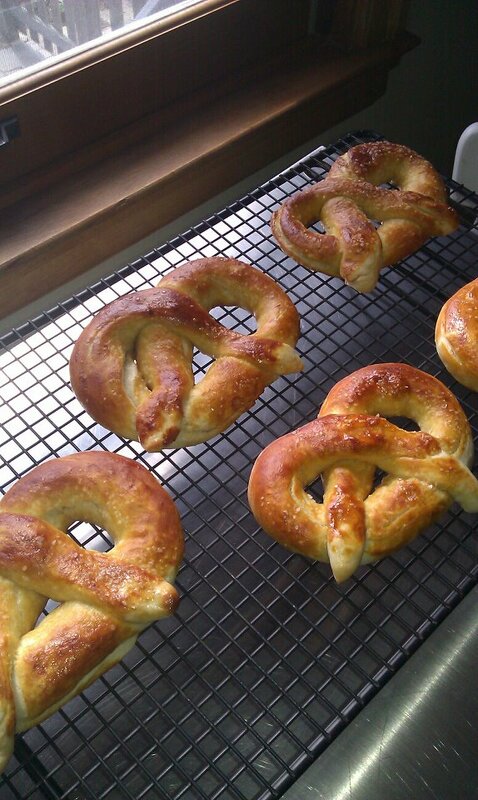 If you have your own favorite pretzel recipe I would love it if you would share it… we love to try new things! In a large bowl, mix together flour, 1/2 cup sugar, and salt. Make a well in the center; add the melted butter and yeast mixture. Mix and form into a dough. If the mixture is dry, add one or two tablespoons of water. Knead the dough until smooth, about 7 to 8 minutes. Lightly oil a large bowl, place the dough in the bowl and turn to coat with oil. Cover with plastic wrap and let rise in a warm place until doubled in size, about 1 hour. baking soda solution and place on a greased baking sheet. Sprinkle with kosher salt. After they are baked, we brush them with melted butter and sprinkle a couple of them with powdered sugar mixed with cinnamon for an extra special kitchen helper treat! I started my Anusara Immersion in January of 2011. The Anusara immersion was one weekend a month for 6 months and made up the first 100 hours of my 200 hour certification. It was the first time I had done any form of yogic education outside of a regular studio asana session. I hadn’t done education of any sort since I graduated from Cosmetology school in 2000. I was definitely scared and showed up the first night with a million butterflies in my stomach and eyes wide. I got settled into my space and began to learn. Adhikara: Studentship, competency, qualifications of a student…. 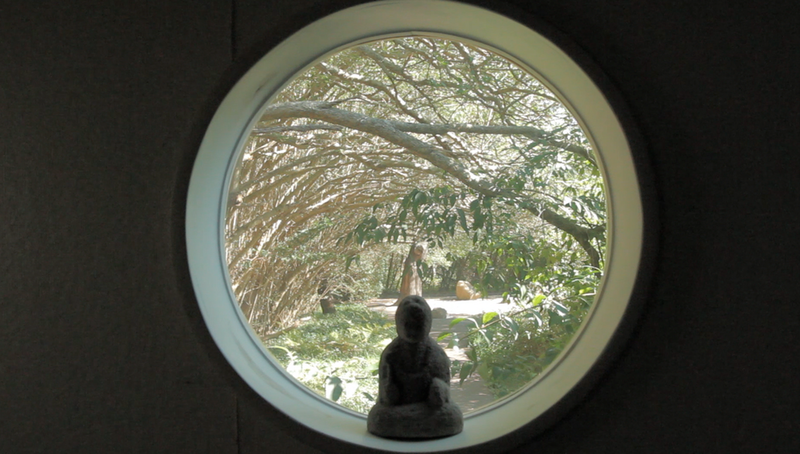 Our openness to receive teachings. 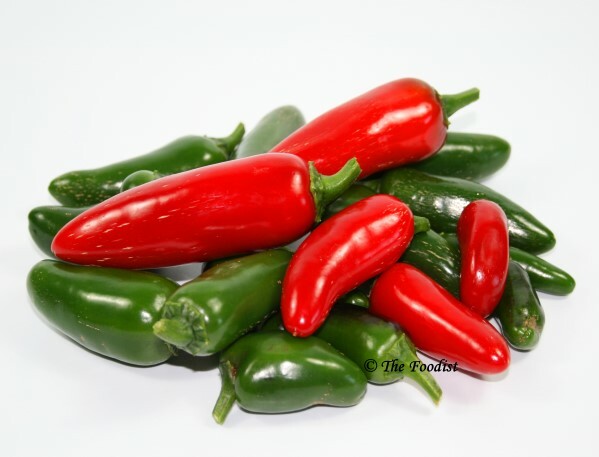 Our teachers Ali Certain and Ronna Rochelle likened it to the spicyness of salsa, and declared that because we had chosen to take on this immersion that our salsas were quite spicy. I wasn’t so sure about that at this time as I felt like this was me sticking my toe in to test the waters, but as the weekends continued, I felt my need to learn more grow. These Immersion weekends were an intense barrage of foreign concepts…. Tattvas, Malas, differences in yogic philosophies and history, anatomy, sanskrit, the spirals, and the Universal Principles of alignment were all hitting a brick wall those first few weekends. We were warned though, that it was when we stepped away from the classroom was when we would start absorbing it. Slowly, but surely my unpracticed brain started to take everything in and on this blog I would love to start breaking down these learnings and let them sink further. It was at this point that I realized that the tantric philophy/yoga that I was studying in the classroom could be applied to my life, my parenting, and my relationships with people. I was in love and so happy. I met many beautiful people and learned many beautiful things. By the end of the six months, I was in tears leaving, not knowing when or how my education would continue. I was confident at this point of the spicyness of my salsa. I started the Immersion thinking that I was testing the waters, and finished it knowing that it was a new beginning. Knowing that I would not be working in the salon much longer. Knowing that I wanted to teach and eventually be a doula. I wasn’t sure how I could become an Anusara Inspired teacher while adding Blooma’s prenatal yoga into it, but I was sure that I could make it work. I also knew that I needed to keep my Kaphic ball rolling or I would lose momentum. So I signed up for a John Friend weekend workshop in Des Moines. I also signed up for Anusara Teacher Training with the Kirk’s in Arizona. I was on my way and I knew that I was on the right path. It was good to know. I need to continue this next week as it is time for me to take my daughter on a spring break adventure to the book store, but it feels good to get this journey out there. Our corned beef is prepped, the irish music is playing, the sun is shining and the kids are playing with all the couch cushions in the living room with the windows open. Happy Sunday and Happy St. Patrick’s Day! We are obsessed with Pho. 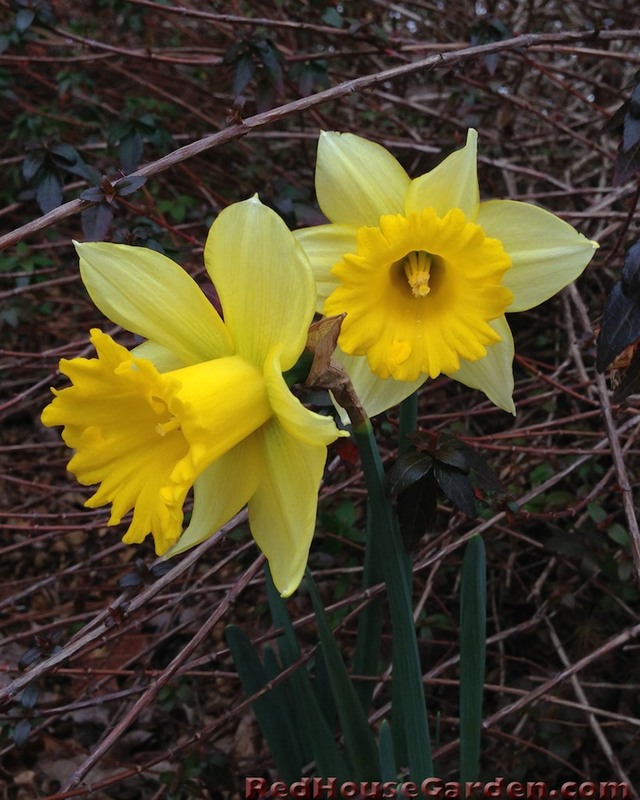 My husband and I have been for years and now our children are…. it is a pretty delicious addiction though, and I am not ashamed! 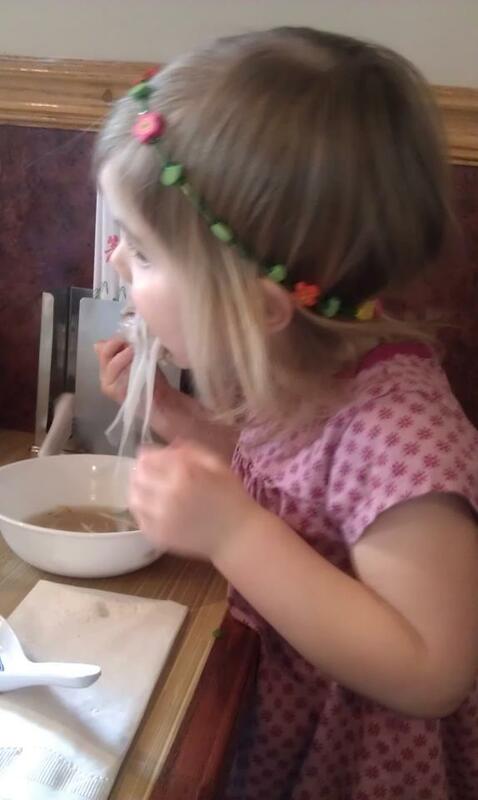 Our kids really like having some control over their food so Pho is great because they can create their own flavor. LBL also likes that his soup can develop through the meal. Starting it as it is given, then maybe adding some lime and basil and finishing with the rich brown broth of too much hoisin. LL right now is more of a purist and typically only adds a bit of basil. I love that they are also learning to use chopsticks! Something I didn’t master until I was an adult. A favorite beverage to drink with their noodles is coconut water with shaved young coconut in the bottom. We have found that there typically is not a “child’s portion” but Pho is usually served in such a large bowl that we just share a bit of ours and it is PLENTY. For those of you that are local, our current favorite is Quang’s on Eat Street. They have plenty of high chairs for the littles and don’t need to be asked to bring the smaller bowls. LL and I typically share the Pho Tai which is fresh sliced beef. My son and husband switch it up more often. A little hint… Pho makes a delicious breakfast and weekend mornings is when Quang’s is at their finest. The steaming, rich broth is a beautiful wake up and you are surrounded by families starting their day together. We used to make this at home as well, but lately with the kids it has just been easier to go someplace. Here is a recipe that we have enjoyed in the past. Thank you to Quang’s for being awesome and family friendly! Kid’s Menu from yesterday’s review! I also went there for coffee and eggs this morning after teaching and it was so yummy! The other thing that I am very excited to do on Future Foodie Fridays is to review restaurants for Family Friendliness. We have always made it a point to take our kids out, it is a good way to practice manners, try new foods and have a fun time as a family. We have noticed in our experiences that there is family Friendly, there is family Tolerant…and there is plain Uncomfortable. So, I would like to start documenting and sharing our restaurant adventures. Calling out those that are lacking and giving mad props to those that appreciate even the smallest of foodies. I will also be including LBL and LL’s opinions and favorite dishes. They will be giving the restaurants either a thumbs up, a thumbs sideways or a thumbs down. 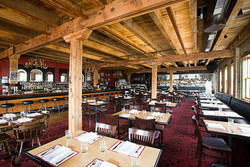 Family Friendly: They provide comfortable seating, a delicious and varied children’s menu, and a welcoming atmosphere. Family Tolerant: Half hearted attempt at comfortable seating, a children’s menu, maybe not as welcoming. Okay, but YOU have to do the work: They may have one high chair hiding in the basement, it needs to be dusted and may not buckle, no children’s menu but “you can order an appetizer!” , your arrival is greeted with surprise, but you don’t necessarily feel unwanted. Don’t take your Kids here: No seating available for families, no menus or even options, they just don’t want you here and it is their loss. I want to start our reviews off with a shiny bright star! Located in NE Minneapolis. An area that considering the amount of young families there, isn’t always super friendly, but it is getting there. We have been here many, many, many times! The first time we took a kid there was LBL’s 2nd birthday. We had always hesitated, not sure if we would be welcome in this newer hipster atmosphere, but we loved the food and were craving it that night. When the server found out that we were celebrating his birthday she sweetly brought him a small pumpkin to decorate (his birthday is Halloween) Score! We are always greeted here with smiles and no surprise. They provide both boosters and high chairs. They do a great job of trying to get families either by the open kitchen or the large windows facing the street… providing visual entertainment and a bit of noise barrier. I especially like to be close to the kitchen as they like to watch the action and it is close to the restrooms. They provide crayons and their Children’s Menu is also a pretty nature scene that they can color. This is a supperclub so their Children’s Menu is pretty classic american, but well crafted. I don’t mind letting LBL order a restaurant Pb&J when it is on freshly baked bread, includes restaurant made jam and is served with a side of freshly made potato crisps. 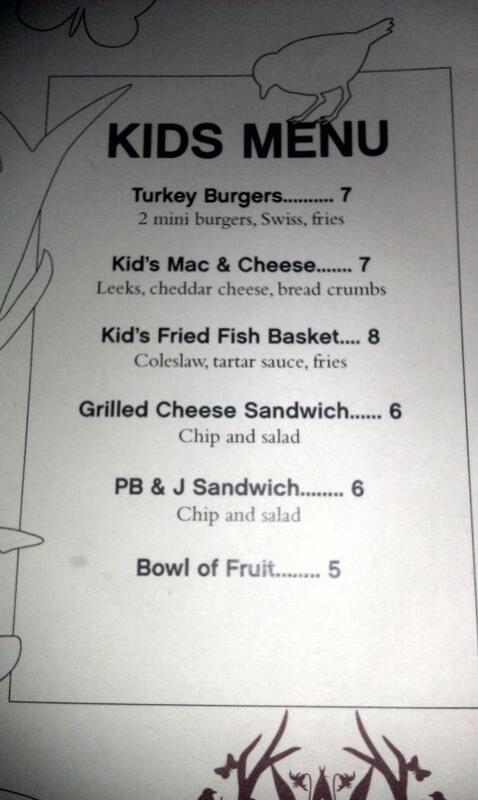 Unfortunately, I noticed too late that their Children’s Menu was not online so I will have to add that this weekend. 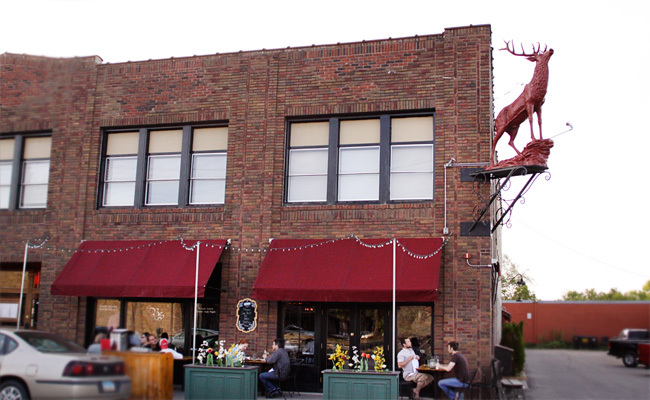 When we go to Red Stag, we go in the early evening… probably no later than 6:30. I would love to hear anyone’s opinion if they have gone at a later time. It just seems like more of “adult time” after that and frankly my kids are usually asleep by 7. They take reservations but also save tables for walk ins. Red Stag also offers a delicious brunch on the weekends and this is definitely a wonderful time to take your kiddos there! Best part, they give samples of their coffee cake right away which gives mommy and daddy a moment of quiet to drink some coffee. They do not have a kid specific brunch menu, but have always been very willing to work with us. We usually split between the two of them fresh berries(brought out right away), a pancake(they are large) and sausage. We LOVE Red Stag Supperclub!!! LBL’s review: His favorite is the PB&J, described above… he usually orders this unless gnocchi is on their app menu. He loves the gnocchi! He is also a big fan of the buffalo plaid attire and watching the kitchen. Thumbs up! LL’s review: She really likes the fish bites and if there for brunch I have to hide my lobster egg salad sandwich from her lest she eat it all! She really appreciates that she can flip her coaster and receive bubble water instead of still and she is also fond of the fish art in the entryway. Thumbs up! Thank you Red Stag for being awesome and welcoming! I started practicing yoga about 7 years ago. I started at a Core Power with one of their first week free deals. I really liked it and continued there until I became pregnant with my son. I told my teacher right away because being so new to yoga I didn’t know what I should still be doing or what might hurt me or the baby. The teacher was very sweet and just told me to avoid twists and inversions, I have found this to be the typical response from teachers that aren’t quite sure but don’t want anyone to get hurt. So I happily continued with what I was doing, but around the beginning of my second trimester I started to notice that she was seemingly changing her class for me. It was kind of weird as I was the only one pregnant and I thought that others were noticing as well. After this, I started to seek out a Prenatal yoga teacher. I discovered Sarah Longacre, the founder of Blooma. Though Blooma hadn’t been born yet, she was still a wonderful advocate for motherhood, natural birth and provided much needed education to our community. Before her classes, I really liked yoga…. after her classes I loved yoga! 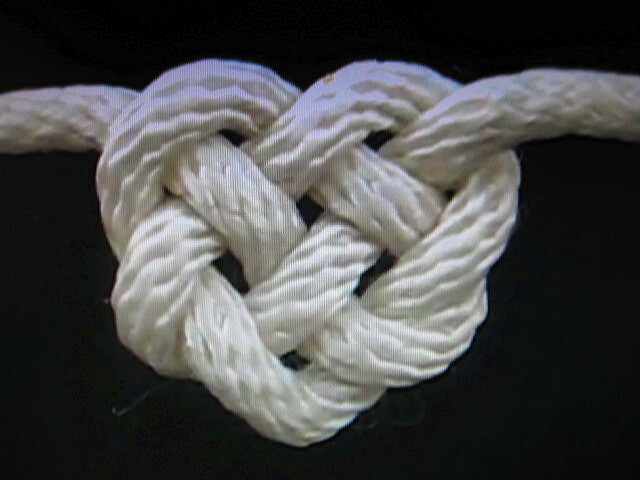 Her classes added the spiritual link to my practice. I continued to practice with Sarah through all of my pregnancy up until the end and I had a beautiful natural, drug free birth which I may write about in a different post someday. After the birth of my son, I was left wondering where to go next. I knew that Corepower wouldn’t cut it for me anymore, but I really had no clue what to look for. I started to just search for convenient times and locations, (I was a newborn mother after all) and ended up finding my teacher Laurel. At that time she was transitioning her teachings from Jivamukti to Anusara and I happily followed because she was an amazing teacher, Anusara felt “right” for me and the time of the class worked with my schedule. In the following years I started to notice that yoga was more than exercise to me and that I wanted to go deeper. I wanted to start doing workshops and trainings but I was pregnant again so I happily joined Sarah again at her new studio Blooma! It was wonderful to be back in her protective space again with all those beautiful bellies but what made it amazing was that I had my Anusara practice to add to what Sarah was providing. The UPA’s fit so well into prenatal yoga and into birthing education. LIGHT BULB MOMENT!!! I suddenly knew what I wanted to do! Anusara yoga done Blooma style! Great! I figured out my dream… now what. I recovered from birthing my daughter and got right back into practicing with Laurel, and started to research teacher trainings and workshops. I consulted with some of my favorite local teachers. Am I Yoga Teacher ready? What in my life would need to change? Do I need to be a vegan? How can I possibly come up with the type of beautiful themes that Laurel does? Sarah is so inspiring, can I be that? I don’t know how to meditate… How do I do this? Looking back, I was in the ultimate state of Kali. Creation being formed in the chaotic darkness and I had no idea where to take my energy. One day, I went to class and there was a new flyer on Laurel’s table. 100 hour Anusara Immersion with Ali Certain and Ronna Rochelle. It was local, reasonably priced and on weekends spread out over the course of 6 months. This was my chance. The next day with my heart in my throat, my mind swimming with question and the creative energy of Kali roiling in my gut. I signed up for the Immersion. To be continued in a future post….